I wanted to follow-up the IsoTech08 conference and the talk I delivered there on Web 2.0 and Insurance with answers to a few questions that came from the audience. Q: the new trends in the innovative use of the web seem to give direct insurers an advantage over indirect ones, as they focus a much larger portion of their resources in direct to consumer services and marketing. How can traditional agent centric companies compete? Agents provide a personal relationship and value that is appreciated by many customers. Companies can empower these agents with the latest tools and technologies that will allow them to provide their customers with the best user experience and convenience that will provide the best of both worlds. The direct providers like Geico, provide tools but no context or tailoring to the client specific needs. Agents should be provided with a white label set of tools (tools that the Insurer provides but can be customized with the branding, contacts and products that a specific agent provides). When providing a quote, it is not a printed document but a link to a personalized client site with all the details of the quote listed and the ability for the client to make changes and see options. Agents can communicate through messages or live chat and provide all the options and discounts. The Customer gets a completely customized experience guided by a trusted agent. Insurers that will empower their agents with tools like these will not have a problem to compete successfully. Q: It was mentioned that one of the largest hurdles in the successful implementation of social and collaboration tools inside the enterprise is lack of critical mass of users. How can we ensure that we reach the critical mass and what will drive adoption? Put collaboration tasks within the line of business. Collaboration and social tools are often considered “above the line” or things you do above and beyond your regular work. If an organization can find ways to put the use of these tools in the regular course of doing business, their usage will become just part of doing your job. Examples can include posting files and not emailing them, soliciting feedback through a forum, not in an email etc. Make it the social norm. if key activities happen there, and key executive post and conduct business in the internal social network, it will become the place to be. People will start asking each other if they saw a specific thread or comments and will drive up adoption. Q: Can you provide an example where Mashups provide a solution that can not be addressed using other existing Portal, BI ,EAI and Dashboard tools? 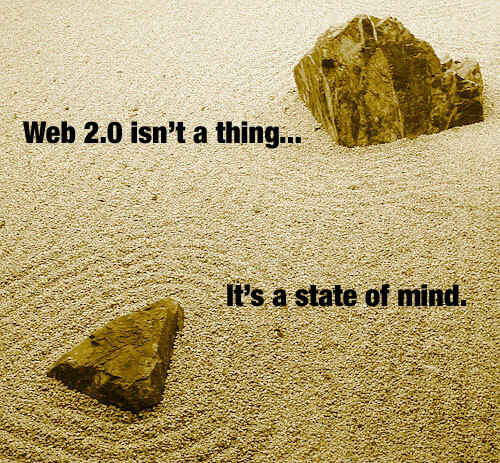 Image taken from: http://www.andybudd.com/presentations/dcontruct05/images/zen2.jpg on April 21, 2008.